The Professional Regulation Commission (PRC) and the Board of Midwifery released results of April 2014 Midwives board exam in 3 working days after the exam. The full list of passers, topnotchers (top 10), top performing schools and performance of schools are available on this webpage as officially released online. See the performance of schools here. A total of 1,093 out of 2,365 passed the Midwife Licensure Examination. 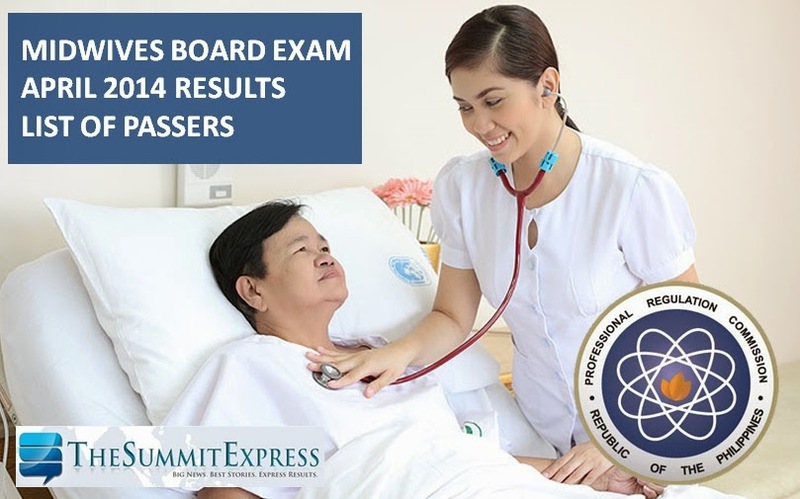 Midwifery board exam was administered in the cities of Manila, Baguio, Cagayan de Oro, Cebu, Davao, Legazpi, Lucena, Tacloban, Tuguegarao and Zamboanga on April 27-28, 2014. Midwives board exam covers the following major subjects: obstetrics, fundamental of health care, infant care and feeding (April 27) and primary health care, professional growth and development (April 28). In April 2013 Midwives licensure exam, the full results were released in 3 working days. PRC named 1,173 out of 2,323 who passed the exam. Camarines Sur Polytechnic College-Nabua and Jose Fabella Memorial Hospital School were named the top performing schools for having 91.55 and 85.25 percent passing percentage. Bicol University-Legazpi graduate topped the board with 89.70% grade. In November 2013, results were announced in 4 working days after the test. A total of 1,336 out of 2,902 passed the Midwife Licensure Examination. University of the Philippines School of Health and Sciences-Leyte was the only top performing school based on Commission Resolution No. 2010-547 series of 2010. New Lucena Polytechnic College graduate garnered the highest place (top 1) with 88.60 rating.